The fourth-generation Cortina was a more conventional design than its predecessor, but this was largely appreciated by fleet buyers. Generally a rebody of the Mark III, as an integration of Ford’s model range, this car was really a rebadged Ford Taunus. However, although the updated Taunus was introduced to Continental Europe in January 1976, Ford were able to continue selling the Cortina Mark III in undiminished numbers in the UK until they were ready to launch its successor as the Dagenham built Cortina Mark IV, which went on sale on 29 September 1976. Many parts were carried over, most notably the running gear. The raised driving position and the new instrument panel had, along with some of the suspension upgrades, already been introduced to the Cortina Mark III in 1975, so that from the driving position the new car looked much more familiar to owners of recent existing Cortinas than from the outside. The most obvious change was the new body, which achieved the marketing department objective of larger windows giving a better view out and a brighter feel to the cabin, but at the expense of body weight which was increased, albeit only marginally, by approximately 30 lb (14 kg). Ford claimed an overall increase in window area of some 15%, with “40% better visibility” through the wider deeper back window. Regardless of how these figures were computed, there must have been substantial weight-saving gains through reduced steel usage in the design, given the unavoidable extra weight of glass. This series spawned the first Ghia top-of-the-range model, which replaced the 2000E. The 2.3-litre Ford Cologne V6 engine was introduced in 1977 as an engine above the 2.0l Pinto engine, already a staple of the Capri and Granada ranges. However, 2.3-litre Cortinas never sold particularly well in the UK. The Cologne V6 was certainly a much smoother and more refined power unit than the Pinto, but the V6 models were more expensive to fuel and insure and were only slightly faster, being about 0.5 seconds faster from 0-60 and having a top speed of about 109 mph compared to the 104 mph of the 2.0-litre models. The 2.0 Ford Cologne V6 engine continued to be offered on Taunus badged cars in parallel with the Pinto unit, and offers here an interesting comparison with the similarly sized in-line four-cylinder Pinto engine. The V6 with a lower compression ratio offered less power and less performance, needing over an extra second to reach 50 mph (80 km/h). It did, however, consume 12½% less fuel and was considered by motor journalists to be a far quieter and smoother unit. The 2.3 L was available to the GL, S and Ghia variants. A 1.6 Ghia option was also introduced at the same time as the 2.3V6 models in response to private and fleet buyers who wanted Ghia refinements with the improved fuel economy of the smaller 1.6 Pinto engine. Few cars were sold with the 1.6 engine though, the 2.0 Pinto was always by far the most common engine option for Ghia models. Two-door and 4-door saloons and a five-door estate were offered with all other engines being carried over. However, at launch only 1.3-engined cars could be ordered in the UK with the two-door body, and then only with “standard” or “L” equipment packages. In practice, relatively few two-door Mark IV Cortinas were sold. There was a choice of base, L, GL, S (for Sport) and Ghia trims, again not universal to all engines and body styles.Rostyle wheels were fitted as standard to all Mk.4 GL, S and Ghia models, with alloy wheels available as an extra cost option. The dashboard was carried over intact from the last of the Mark III Cortinas while the estate used the rear body pressings of the previous 1970 release Taunus. Throughout its production life, the Mk.4 was the most popular new car in the United Kingdom. Despite this it is now the rarest of all Cortinas with only about 200-250 examples left according to DVLA records. Scant rustproofing (much improved on the later Cortina 80/Mk.5 models) and popularity with banger racers accelerated its demise. 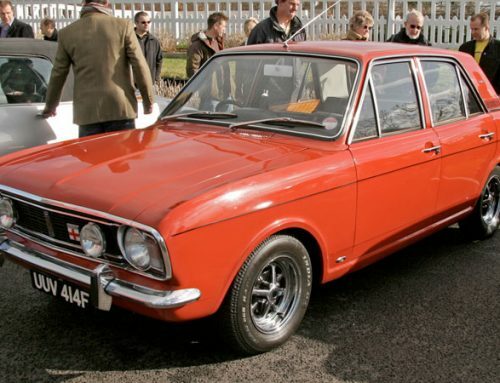 And as with other best-selling mass produced cars of the time such as the Morris Marina and Vauxhall Viva, the Mk.4 Cortina did not acquire classic status while there were large numbers of them still around and able to be preserved. Both Mk.4 Cortina S models are now particularly rare with less than a dozen 2.0S and just 2 of the 2.3S models thought to survive today. Any Mk4 2.3 model is a very rare car in the UK now, with only about 20 remaining according to the DVLA. The S models were discontinued when Mk.4 production ended in August 1979. In their place, optional ‘S’ equipment packs were available as an upgrade for most Mk.5 models. Again, Ford Australia built its own versions with the 2.0-litre 4-cylinder Pinto unit and the Ford Falcon’s 3.3 and 4.1L 6-cylinder unit. Interior door hardware and steering columns were shared with the Falcons and the Aussie versions also had their own instrument clusters, optional air conditioning and much larger bumpers. A considerable number were exported to New Zealand under a free trade agreement where they were sold alongside locally assembled models similar to those available in the UK.